We will update the page each month. A hush falls over the ground as a blanket of soft white fluff covers the sleeping earth. What a glorious time of year. We are so lucky to be able to see nature in all of its glory every season. Now that the crisp cool air, the wonderful smell of snow and burning fireplaces tell us that winter is here and that we need to go out and explore all that it has to offer. welcome Winter, we hear your call! Yes, I know we all dread the fact that our children are stuck inside this winter with nothing to do! But Don't Fear! We have the cure. There are many wonderful things to do in our area and we are going to take full advantage of them, so keep and eye out and we will be ready for what ever winter wants to dish out! We have a lot of little treasures in own backyard, from science museums, to the zoo in the winter! So lets put our thinking hats on and get ready to beat the winter cold! Well, A little Update... It so far has been a wonderful winter, we are keeping our little ones very busy. I am working on the Spring events and it looks like we will be just as busy!! Now if you have any ideas for some play time fun please email me. Our Winter 2006/2007 issue of our newsletter is not yet complete, it will be added to this section here. Each month the newsletter will include latest news, interesting facts, upcoming events, and member names. 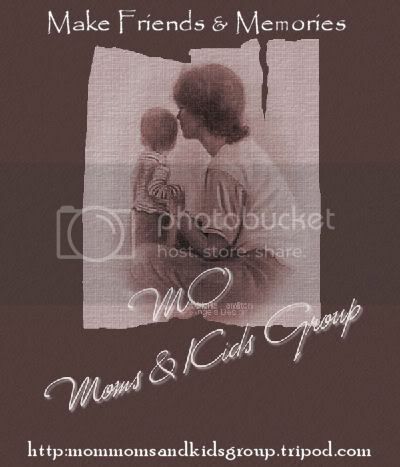 Shop the MO Moms and Kids Items Here!!! Please Look at our Winter calender of Events, and ckeck you email for news letter for times and places to meet. On the other side, you will have the Name, Address, and contact Phone Numbers along with Identifying information . Can You give Mouth to Mouth? Email us and see when the next local classes are! The person you save may be a loved One!!! !